The Toro 51621 UltraPlus steps in to make your life easier. The best part about this unit? Easy. It works as a blower, but it also has a vacuuming function. You got two tools in one. Despite most expectations, the sophisticated model is quite easy to use and it does not put too much strain on your arms. It is lightweight and can complete its job in no time. What else can you ask for? Clearing leaves is piece of cake with that oscillating nozzle. You got a wider blowing surface, so you can cover large areas in less time. Adjusting the speed is not such a big deal either. With up to 250MPH, the results are exquisite. There is a small knob that allows customizing the speed though, so you should not face any problems. Another good news is that converting from the blower to the vacuum does not require any tools. It is only a matter of choosing the right setting and the air goes in a different direction. No product is perfect for everyone. This one may not raise to everyone’s expectations either. 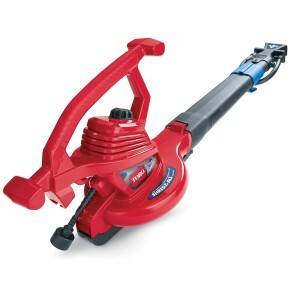 For example, Toro’s blower weighs around 9 pounds. It does not seem too much. However, when you use it over and over again, chances are it will feel a bit heavy, especially if you are not used to such things. Other than that, the extension cord is not included, but still, using an extension cord will limit your movements. Make sure that you do not plan to blow dead leaves off the sidewalk if the sidewalk is 300 feet from your house. As a short final conclusion, Toro 51621 UltraPlus Blower/Vac has been specifically developed for a particular segment of consumers. First, it makes a great choice for homeowners who want their homes to be tidy, especially during the fall season. It is also great for indoor vacuuming. Second, it is great for small businesses. It is imperative to maintain a tidy entrance or customers will inevitably be chased away. On the other hand, it is not so good for large businesses or industries. While it does provide a continuous use, the cord limits its movement. As for the actual features, there is not much to complain about. 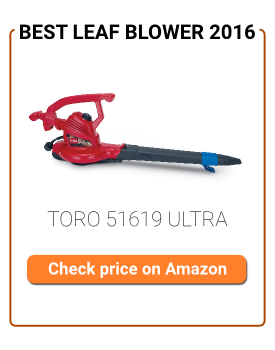 Toro is a solid name in this industry and this product does raise to the expectations. It has the required features for a top-notch operation around any household, while durability is exquisite. Sure, just like for any other appliance, a little maintenance is needed every once in a while. A leaf blower becomes the quick and convenient alternative to a broom or a rake. Forget about cleaning dead leaves at every few days with a broom. It kills your back, but you also have to do it over and over again. If you run a small business, it feels like working out. At this point, a leaf blower is a great choice. You basically invest in your own comfort, but also in the overall efficiency of your cleaning operations.